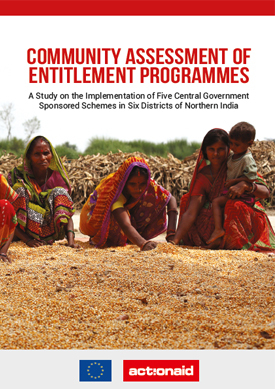 A Study on the Implementation of Five Central Government Sponsored Schemes in Six Districts of Northern India. The idea behind Community Assessment of Entitlement Programmes: A study on the implementation of five central sponsored schemes in six districts of Northern India was to understand how public services related to food security, social security and housing are being provided in six of the most backward districts of India. This study prepared by the Democratization Knowledge Activist Hub of ActionAid, is based on field surveys. The surveys were designed with an action-oriented edge to understand how change can be affected through bottom-up processes. This report has been prepared to share the learnings of the surveys to influence policy and help activists working with vulnerable communities.